For my next post, I’m going to share how I do a technique I came up with which I all S.M.A.R.T. pomodoro tomatoes (the word “S.M.A.R.T.” in that sentence takes you to one link, and the word “pomodoro” takes you to another link). This technique I’ve come up with is for fostering writing affinity, or developing what Bolker calls writing addiction. For now, I’m inspired to post about how I’m writing right now. I’m methodical so it’s not super fast for me, but it’s going just fine. I am looking forward to speeding up with all this in the future simply as a by-product from having more experience. I will likely always take a fair amount of time. I write just like Monica Lee says she writes (I feel SO affirmed) in her chapter “Finding Voice: Appreciating Audience” (see Rocco, T. S., & Hatcher, T. (2011). The handbook of scholarly writing and publishing. John Wiley & Sons). I was writing today using my resources and realized: “Where would I be without THESE?!? ?” I mean, nothing’s really a necessity, and even if I only had a typewriter, I’d be pecking away! LOL! But, I do need to document these resources for my future self. I share about them below. Of course, your mileage may vary. Especially regarding the last resource, which works wondrously awesomely for me because I can only get out drafts by turning not-so-great drafts into better drafts pretty methodically and visually. Two of the three resources below I found on my own. One I discovered at PhinisheD.org. Two are pretty normal. One is not-so-normal, and I have completely hacked it! It’s also slightly quirky, but pays me back over and over for any and all quirks. Feel free to post a question in the comments or email me if you are testing it out and have questions about how I get the most out of it. This tool is all about facilitating good WRITING. It is not for final publishing, IMHO (too many little formatting issues and not the best citation method for ME, but other “fans” don’t complain of these). Depending on what you write in your various “text containers,” you can send sentences, paragraphs, sections, chapters, etc. ONE AT A TIME or the whole draft to an open MS Word file. Then you can format (e.g. change straight quotes to curly quotes with a find all and replace all –ugh!) and do dynamic citation via, say, the Citavi Add-in if added to MS Word (that way the reference list gets built automatically). That’s what I do. If you want to try it but are on a Mac, you could but would need to run something like Windows Parallel. 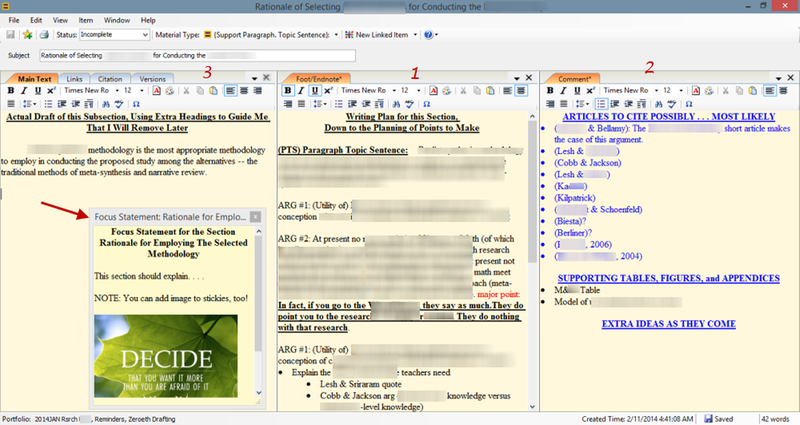 Resource #1: The Single Method of Note-taking and Writing for a Dissertation as detailed here. PRICELESS! I would not finish without it. Many at PhinisheD benefit from it. If you read the reviews . . .
Resource #3 (see image and videos below) is my life saver. Despite the straight quotes thing. (And dashes. That’s the last thing: Why don’t long DASHES export to MS Word? ). But genuinely, it would take me hours to explain all that it permits for me because of the way I use it. If it didn’t exist, I’d still finish. But I write 1,012% better with this resource than in Scrivener or MS Word because of what writing is like for me and how writing works and goes for me. The main, MAIN thing is that this resource allows me to very SEAMLESSLY blend the Single Method of academic reading, note-taking, and writing; the advice in the Carlis “one-draft dissertation” document (ignore the title if you like because beyond it all of the advice therein is just so illuminating for newbies); and Dr. Murray’s snack-writing method as I discussed elsewhere at this blog (feel free to use the search box to learn about it). Below are a picture and links to videos I made (old videos, now, that don’t show my now-learned hacks but still explain the resource). Note: The red arrow in the picture points to a tool you have called “Reminders.” Of course I’ve completely hacked and repurposed this tool. 🙂 It’s resizable, it floats with you wherever you go on your computer or the Internet, etc, and you can give it a title. You can open up multiple ones, drag and drop them onto your outliner in the program. I write my paragraph’s or section’s Focus Statement in one, and let it hover over my drafting as I draft. You can paste and resize images in it (and that is a hack move so it takes a special move to do). Then you can hover the image over your draft as you write about it. One time I opened up two “Reminders” (I call them “sticky notes”), sized them both to half the size of my computer screen, placed them side by side, and placed draft #1 inside one and draft #2 inside the other and compared . . . copying and pasting, transferring headings . . . numbering sentences and paragraphs in order to ORDER things . . . comparing the before-and-after of how the draft read after moving one paragraph . . . etc. Creating a reverse outline of a draft is super easy: Open a new file, paste your composition in a “text container.” View it. And start building the outliner, which sits to the left of all drafts. Unlike in Scrivener (which is great, too), adding an item to the outline doesn’t necessitate creation of a new, placeholder text file. You can make it so if you want to per outline component or not. You choose PER outline item. I explain more in the caption to the image below. NOTE: To enlarge the image for better viewing, please click the image. It will open in a new browser tab. NOTE: I’ve totally repurposed “Materials” in Idea Mason. In Idea Mason, you can create different “Materials” (for building draft content) and configure them however you like. I decided to take a blank container type, call its type “(sub)section,” and save the configuration of it to display three windows side-by-side. Every time I create a new (sub)section type of material, it opens up with this layout. Meaning, the comment and footnote are tabbed documents drug to the top. I don’t use these windows for comments or footnotes. Not at all. 🙂 To do good writing with this setup: First I create the writing PLAN in the middle window. Next I think about who to cite to support my intended writing and what tables, figures, and appendices to use to support the parts of the writing I’ve planned. I type that up in the right-most window. Finally, I draft in the left-most window, copying quotes and paraphrases from Citavi because the citation info comes along. Of course I draft referring constantly to the middle and last windows. You can click and send to MS Word whatever you like (the content of each of the windows, one window, or two of the windows). NOTE: Video #5 (3 minutes in length) is no longer an issue. The developers responded immediately and remedied it. They are very responsive. You can check out reviews here and otherwise learn more at other pages of its website. As always, take care, and happy writing! This entry was posted in academic workflow, Citavi, concept mapping, effectivness, efficiency, getting unstalled, Idea Mason, momentum, software product, video, writing by Z. Sanders. Bookmark the permalink. I have the same question as Joseph. What DID happen to Idea Mason? What happened to Idea Mason? Any ideas? Are you still using as a main workflow component? What would you recommend as an alternative now that program seems no longer available? Thank you!